Population Finder is a report included with the Family Finder DNA test from Family Tree DNA. Today, this report is one of the best options for measuring a person’s overall ethnic ancestry. By comparing your DNA to that of global populations, it does what’s called a biogeographical analysis. 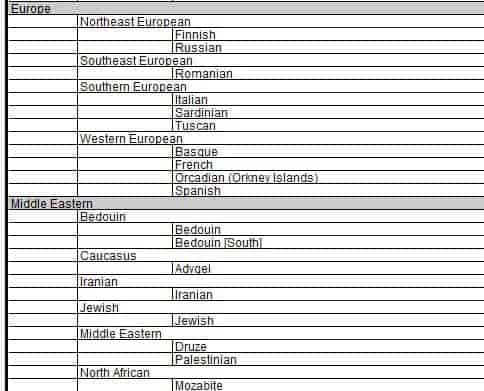 NOTE: FTDNA has upgraded their ethnicity test and the new report is called MyORIGINS. So the Population Finder term is being phased out. As part of Family Finder, it uses your autosomal DNA, which reflects the contributions of ALL your ancestors going back at least five or six generations. Many people consider Population Finder to be the most scientifically credible ethnic DNA test available. It only uses genetic population data that has been peer-reviewed and accepted by the scientific community. The National Geographic Society uses the Family Tree DNA laboratory to run its Geno 2.0 tests. We can expect this close relationship to generate enhanced results in the future. Fortunately, once you do the Family Finder test your report will be automatically updated as the programming or reference populations change. 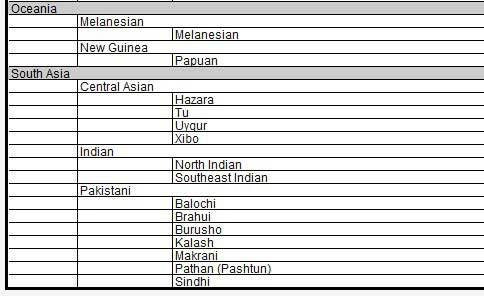 The following table shows all the reference populations at the time I initially created this web page. Your report will provide a percentage breakdown of your ancestry into as many as four of the seven continental groups or subgroups. Unless your ancestry is unusually mixed, however, you will probably see findings from only one or two continents. My family tree shows mostly British and other Western European origins…and these results are consistent with that. Some branches of my tree have not been explored yet. So the small percentage from southern Europe provides an important clue as I continue to delve into my family’s genealogy. This is a good example of how Population Finder uses discrete populations as an indicator for a larger area. I may not have any ancestors who are specifically from the Orkney Islands in Scotland. But Orcadian is currently the only population group from the British Isles. Combine that with a match to French and a large percentage of my ancestry can be confidently confirmed as Western European. The more mixed your ancestry, the more revealing this report can be. A dark-skinned adoptee, for example, can finally determine if her ancestors were African, Spanish, Asian, or Native American. NOTE: Population Finder can find and confirm major components of your ancestry. But the absence of any particular ancestry in your report does not prove that you don’t have it. That’s because DNA inheritance is random and you may not have received enough DNA from one distant ancestor to be detectable. If you test yourself, you will see the collective ancestry of your ancestors from the last five or six generations. If your parents are alive, it would be more informative to test each of them instead. Their results would reach out another generation AND you would know which side of your family carried DNA from specific populations. NOTE: Testing yourself and a sibling who is not your identical twin may produce somewhat different results. That’s because each of will have inherited different markers from your parents. Remember that Population Finder is just one feature of the Family Finder test. Most likely your test will produce the names and email addresses of many people with whom you share a common ancestor. Most of your matches will be distant cousins, though once in awhile people discover first cousins or previously unknown siblings. By comparing known surnames and geographic locations with these newly found cousins, you may be able to identify that common ancestor and expand your family tree. Lots of people are doing this every day with Family Finder. Click this link to Family Finder to see the current price and place your order. Family Tree DNA. Click FAQ at the top of the page and scroll down to Understanding Results: Population Finder.